Sir Gilbert Lewis (d. 1883); by descent to his nephew, Sir Henry Duff Gordon (in an album); (sale, Sotheby's London, 19 February 1936, no. 89); Sir Robert Witt, London (1872 - 1952) (Lugt 2228b), with Wengraf and then with Stephen Spector; Mr. Charles (Tillie) Goldman, New York; (sale, Christie's New York, 23 January 2002, no. 9); purchased 2002 by NGA. Tiepolo, a Bicentenary Exhibition, Fogg Art Museum, Cambridge, 1970, no. 60. The Poetry of Light - La poesia della luce: Venetian Drawings from the National Gallery of Art, Museo Correr, Venice, Venice, 2014 - 2015, no. 98. Oppé. A.P. 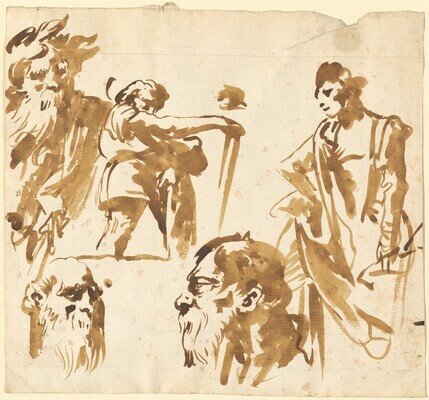 "A Fresh Group of Tiepolo Drawings." Old Master Drawings (1930): 31. Tiepolo: A Bicentenary Exhibition. Exh. cat. The Fogg Art Museum, Cambridge, MA, 1970: no. 60. Gealt, Adelheid, and George Knox. Giandomenico Tiepolo, Disegno del modo. Bloomington, 1996: 121, under no. 19.